This latch top square mirror compact has a wonderful design that keeps the mirror closed and secure. With a beautiful silver finish this compact mirror can be engraved with a name, initials or message to make it a wonderful personalized gift for that someone special. We have a wide variety of personalized mirror compacts that can be engraved with names, dates or a message of love. Customized compact mirrors also make wonderful bridesmaids gifts and wedding favors. We carry engraved oval compacts, square compacts, silver finished compacts, compacts with rhinestones, and pearl finished compacts. These elegant engraved compact mirrors will keep you looking beautiful and in style. 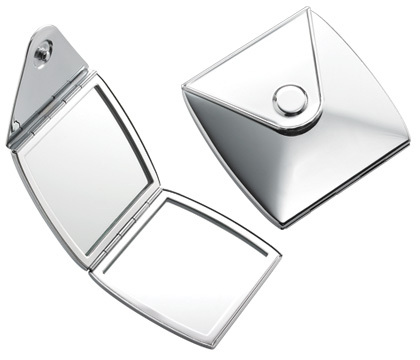 With a slim sleek design these mirrors can easily fit into any pocket or purse. There are many font styles & logos to personalize your engraved gift with. These engraved mirrors are a perfect gift for any woman in your life.